On Sale Now! 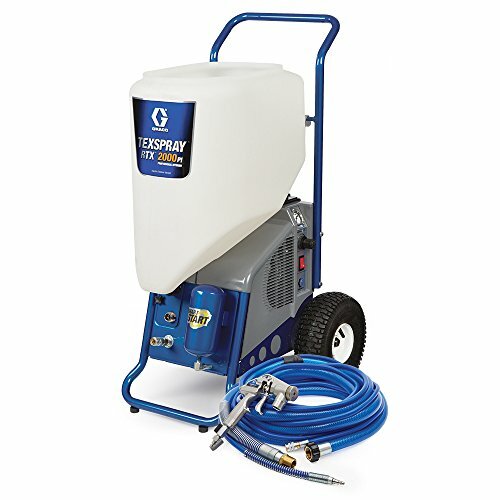 Save 3% on the Graco 17H573 TexSpray RTX 2000PI Texture Sprayer by Graco at UCBC Group. MPN: 17H573. Hurry! Limited time offer. Offer valid only while supplies last. The TexSpray RTX 2000PI Pro Interior Series Texture Sprayer is ideal for tradesmen and contractors for residental and light commercial interiors. The TexSpray RTX 2000PI Pro Interior Series Texture Sprayer is ideal for tradesmen and contractors for residental and light commercial interiors. Graco's exclusive RotoFlex pump is built with a flow-through design providing smooth material flow for uniform coverage and a consistent spray pattern everytime. SmartStart System's soft start automatically starts the pump and compressor when gun trigger is pulled and shuts off when released reducing noise and extending the pump and compressor life. Keep maintenance simple with the new FlexChangeTM Pump System that lets you swap out a pump in seconds with no tools eliminating costly downtime at the job site. Sprays simulated acoustic and drywall mud.